The most influential and substantial leader, after Hitler, in the pre-1933 National Socialist Party was Gregor Strasser. 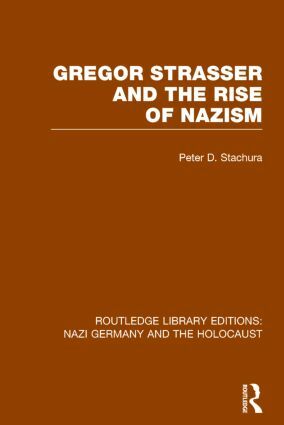 This book (originally published in 1983 but as yet not superseded) is a comprehensive and scholarly assessment of Strasser’s significant and ultimately tragic career, based largely on previously unpublished German archival material. Strasser’s importance as a Nazi propagandist, organiser, ideologue and spokesman is examined and the analysis and interpretation which follow are fundamentally revisionist in that many of the accepted ideas about Strasser’s career are challenged and shown to be untenable. The book provides important insights into an interesting personality which in turn considerably enhances our understanding of the character of early National Socialism and the politics of the Weimar Republic. Party Leader or Weimar Politician, 1930–2?